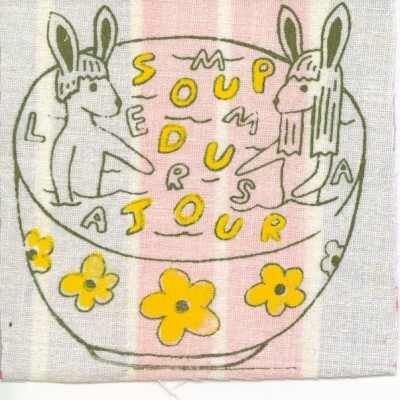 Lars Paulsen and Emma Hendry make up the Massachusetts-based twee pop duo Soup Du Jour. Their eponymous debut EP is a pleasant and interesting, if not completely compelling, affair that bears more than a passing resemblance to the short-lived duo Moldy Peaches, complete with rabbit references in the artwork and lyrics. Paulsen and Hendry had a personal as well as professional relationship while writing these songs, and the songs do reflect this with a childlike naïveté. However, this duo trades in the Peaches’ scatological humor for references to existentialists and odes to historical Russian figures. Paulsen’s gentle guitar work and Hendry’s haphazard keyboard create a carnival-esque atmosphere that alternates between menacing and inviting. With so many nice ideas presented so unpretentiously, it’s a shame that many of these songs do not appear fully-formed. While the standouts “Rasputin, Ode 2”, “Best Day Ever(y) Day”, and especially the beautiful “House Boat” show potential for the band, many of the other songs on here feel like a series of interludes offering a few nice ideas here and there but are never really elaborated upon. There is enough potential here, however, to anticipate a more complete sounding long-player in the future.